March arrived like a lamb Monday as the temperature climbed to 40 degrees, but snowy weather pushed into the area last night and it was 31 degrees here this morning. Only .3 of an inch of snow was recorded at the Goshen College weather station by 7 a.m. today, but the white stuff fell over Goshen for much of the morning. Standing water on U.S. 20 near C.R. 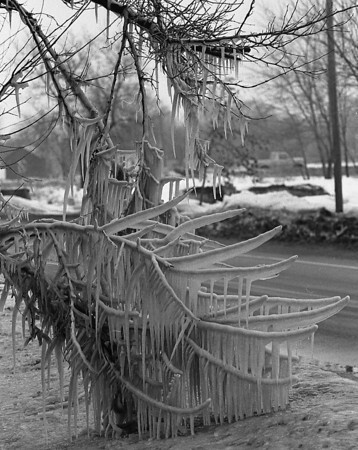 17 has been splashed by passing vehicles up onto this tree branch, creating this ice sculpture along the highway. Driving was hazardous again today because roads were covered with slush and snow.